The Netherlands is one of the few countries where euthanasia is legal under strict conditions. 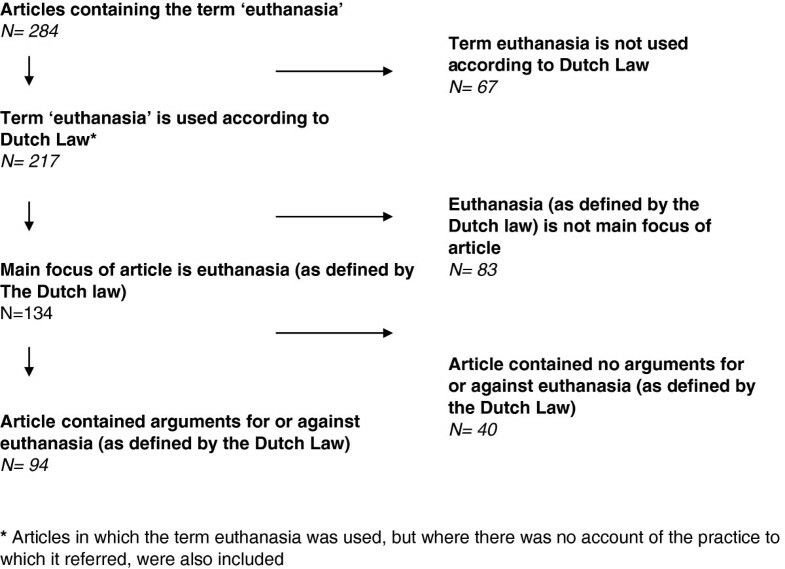 This study investigates whether Dutch newspaper articles use the term ‘euthanasia’ according to the legal definition and determines what arguments for and against euthanasia they contain. We did an electronic search of seven Dutch national newspapers between January 2009 and May 2010 and conducted a content analysis. Of the 284 articles containing the term ‘euthanasia’, 24% referred to practices outside the scope of the law, mostly relating to the forgoing of life-prolonging treatments and assistance in suicide by others than physicians. Of the articles with euthanasia as the main topic, 36% described euthanasia in the context of a terminally ill patient, 24% for older persons, 16% for persons with dementia, and 9% for persons with a psychiatric disorder. The most frequent arguments for euthanasia included the importance of self-determination and the fact that euthanasia contributes to a good death. The most frequent arguments opposing euthanasia were that suffering should instead be alleviated by better care, that providing euthanasia can be disturbing, and that society should protect the vulnerable. Of the newspaper articles, 24% uses the term ‘euthanasia’ for practices that are outside the scope of the euthanasia law. Typically, the more unusual cases are discussed. This might lead to misunderstandings between citizens and physicians. Despite the Dutch legalisation of euthanasia, the debate about its acceptability and boundaries is ongoing and both sides of the debate are clearly represented. The role of medicine and society in addressing the needs of patients who suffer unbearably and who request for their life to be ended is frequently debated. In the Netherlands, euthanasia was a topic of debate for many decades, eventually resulting in the legal regulation of euthanasia and physician-assisted suicide . In several other countries, comparable regulation is in place or is currently being debated. These developments often yield emotional responses, and have given euthanasia and other life-ending practices, such as assisted suicide, a prominent place in news reporting. Dutch euthanasia law defines euthanasia as the intentional ending of a life by the administration of medication by a physician at the explicit request of a patient , a definition that has been broadly accepted and adopted in legal regulations in other countries and in research. It is possible, however, that some people, amongst whom may be patients and healthcare providers, have different understandings of what euthanasia involves, potentially confusing them as to what is available under Dutch law, and certainly confusing the ethical debate. A recent Dutch study showed for example that several citizens considered the use of palliative sedation and the ending of life of severely ill newborns to be euthanasia . Many people are exposed to media coverage of end-of-life care issues and mass media is a powerful source of information for the public . Studies have shown, for example, that cancer news coverage influences the beliefs and behaviours of patients and healthcare providers [4, 5]. It is, therefore, important to determine what practices are being referred to when newspaper reports label events as ‘euthanasia’, and to understand how news reporting represents arguments for or against the practice. Therefore, we studied reports about euthanasia in Dutch newspapers to investigate which practices the term ‘euthanasia’ refers to, and to study the content of these reports, in particular with respect to arguments for and against the use of euthanasia. We conducted a content analysis of articles from seven nationwide Dutch newspapers. We selected newspapers because these media have been shown to be a primary source of trusted health information . Our selection strategy was aimed at obtaining a balance between newspapers with a large circulation and newspapers with frequent reports about euthanasia. We also strived for variance in readership profiles, especially with respect to the educational level and the religious disposition of the readers, this latter traditionally being an important factor in Dutch society, reflected in the editorial orientation of some newspapers. We selected, therefore, the following newspapers: Nederlands Dagblad, Trouw, NRC, Volkskrant, AD, Telegraaf, and Spits!. These newspapers are circulated in hard copy as well as electronically. Articles were identified through LexisNexis, a database which contains 98% of all Dutch newspaper articles. Our search period was January 2009 until May 2010. We selected those articles that contained the word “euthanasia” at least twice. We included regular news reports, letters to the editor, comments and features. To ensure reliable coding, we developed, pretested and piloted a coding instrument, containing three stages. The first stage focussed on the use of the term euthanasia. Articles included in the sample were coded to determine whether the term euthanasia was used in accordance with the legal definition, and if not, to what other practice it referred. In the second stage, we first established whether euthanasia, according to the legal definition, was the main topic of the article or not. At this stage we also included articles in which the term euthanasia was used, but where there was no account of the practice to which it referred. The articles were coded to determine (1) whether they referred to specific patient groups, and if so, which; (2) whether the message of the article was supported by numbers (indicating a fact-based rather than purely opinion piece); and (3) whether specific organisations or associations were used as sources of information, and if so, which. 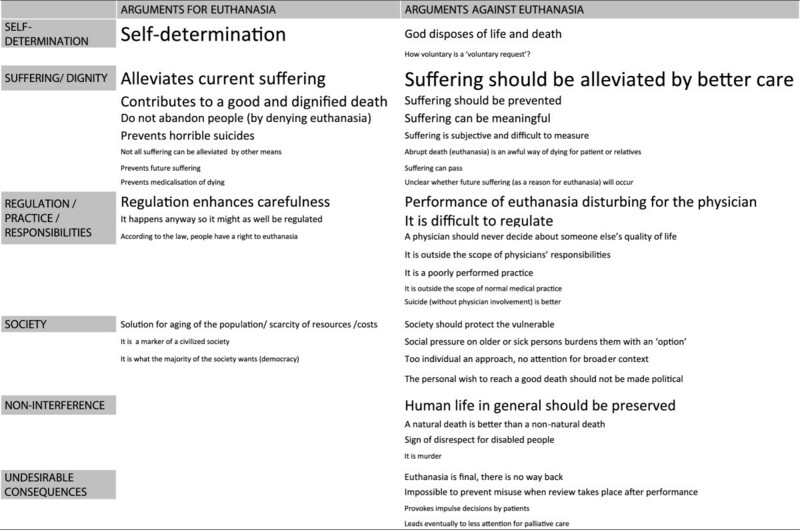 Finally, in the third stage, we assessed whether these articles contained one or more arguments for or against euthanasia, and we listed and classified the content of the arguments. See Figure 1 for a flowchart of the inclusion and coding process. Each article was scored by two researchers (JR and NR) independently. Subsequently, the codes were compared and discussed when different. There were few differences in the scoring, and consensus was always reached readily. The search yielded 284 articles containing the term euthanasia at least twice (see Figure 1: Flowchart of sampling decisions). In 60% of these articles (n = 170) the practice referred to by the term euthanasia was made clear (Table 1). In 24% of all articles (n = 67), the term euthanasia was used for practices outside the scope of Dutch euthanasia law, that is, not referring to the intentional ending of life by a physician at the explicit request of a patient. This concerned in most instances use of the term euthanasia for withholding or withdrawing potentially life-prolonging treatments (8% of all articles), for assisted suicide by physicians (2%) or by others (5%), and for active ending of life without an explicit request of the patient (4%, such as ending of life of newborns). More rarely, the term euthanasia referred to the killing of animals, to the cessation of eating and drinking by a patient, to suicide, or to the disproportionate increase of pain medication without a patient request. In three articles, the term euthanasia was used as a metaphor: e.g. ‘Facebook euthanasia’ (the deletion of friends on Facebook) and ‘workability euthanasia’ (firing employees). See Table 2 for some examples. In 134 of the 284 articles, euthanasia was the main topic. 68% of the 134 articles described the use of euthanasia for specific patient groups (Table 3). These concerned terminally ill patients in 36%, older persons in 24%, persons with dementia in 16%, persons with a psychiatric disorder in 9%, and persons in a coma in 5%. Of 134 articles, 37% were supported by the use of numbers derived from reports of scientific research or opinion polls. Several articles cited opinions or statements from particular organizations. These included political parties, government ministries, medical professional organizations, ‘Right to Die-NL’ (a pro-euthanasia organization) and advisory or executive organizations (e.g. Dignitas in Switzerland). Patient organizations and religious institutions were mentioned less often. aMore than one possibility per article. bProfessional organisation that can be consulted for advise about euthanasia, one of the procedural requirements for legal euthanasia in the Netherlands. Finally, those articles that contained one or more arguments for or against euthanasia were scrutinized (94 of the 134 articles, 70%). See Figure 2 (Arguments for and against euthanasia in the Dutch newspapers) for a visual overview of the results, see Additional files 1 and 2 for a detailed account and see Tables 4 and 5 for some examples. Of these 94 articles, 67% contained at least one argument for euthanasia and 74% at least one argument against. Nearly half (45%) of these articles contained arguments both for and against. The number of arguments for euthanasia ranged from 0 to 5 (mean: 1.33) and the number of arguments against from 0 to 7 (mean 1.72). Arguments for and against euthanasia in the Dutch newspapers. The most frequently mentioned argument for euthanasia referred to the desirability of self-determination by the patient (40%) and to the contribution made by euthanasia to alleviating suffering (28%). Other arguments in support of euthanasia were that it contributes to a good and dignified death (11%), that people requesting euthanasia should not be abandoned (5%), and that euthanasia prevents horrible suicides (5%). The regulation of euthanasia was frequently referred to, predominantly claiming that regulation enhanced a careful and safe practice, and countering arguments against euthanasia suggesting it is a poorly practiced and difficult to regulate practice (20%). In three articles, euthanasia was argued to be a potential solution for the aging of the population or a means to reduce medical costs. Arguments against euthanasia also often referred to the suffering of patients, predominantly by arguing that suffering should be alleviated by better care rather than euthanasia (36%). Further, it was argued that suffering can be meaningful in itself, and that suffering can mostly be prevented, for example by reducing overtreatment or resisting the excessive medicalisation of death, so that euthanasia would not be necessary (8%). Other arguments against euthanasia were that it is disturbing for the physicians who carry it out (13%) and that euthanasia is difficult to regulate (11%). Societal or religious aspects were also referred to as arguments against euthanasia. The most mentioned arguments in these categories were that society should protect the vulnerable (11%) and that human life in general should be protected (19%). Finally, some articles contained the argument that it is impossible to prevent misuse of euthanasia given the fact that the formal review of each case required in the Dutch regulatory system takes place only after the deed has been done (4%). The legalisation of euthanasia and physician-assisted suicide in the Netherland is considered by many to be a social experiment , and people in many other countries keep a (sometimes critical) eye on Dutch practices and debates . While several studies have provided reliable estimates about the frequency and characteristics of the practice of euthanasia in the Netherlands , this is the first study providing an overview of how euthanasia is described and debated in Dutch newspapers. Our study shows that nearly a quarter of Dutch newspaper articles used the term euthanasia for practices that were outside the scope of Dutch euthanasia law. Further, our analysis showed the wide-ranging nature of the public debate. Euthanasia was discussed in varying contexts and situations: for terminally ill patients but even more so for other groups such as older persons, persons with dementia, or persons with a psychiatric disorder. Also, there was a large variety of organisations and associations used as sources as well as there being variety in the arguments for or against euthanasia. The term euthanasia, literally meaning a “good death”, has had different meanings depending on the historical and political context. Nowadays, euthanasia is understood by authorities to be the intentional ending of life by the administration of drugs by a physician at the explicit request of a patient, This definition is broadly accepted and adopted in legal regulations and in research. Yet nearly a quarter of the newspaper articles used the term euthanasia for practices that are outside the scope of this definition. In several instances, the term euthanasia referred to physician-assisted suicide (where the patient and not the physician administers the lethal drug), a practice that provokes quite similar moral debates as euthanasia, but is a different practice . In other instances, the term euthanasia referred to practices that involve moral considerations that are different from those associated with euthanasia, such as the ending of life without a request of the patient (morally more problematic than euthanasia, many would feel) or the forgoing of potentially life prolonging treatments (usually morally less problematic, most would say). Also, the term was sometimes used for practices that do not involve a physician, including for example assisted suicide by non-physicians, suicide, or metaphorical usages. Taken together with the fact that 40% of the newspaper articles did not give any description of what practices the term euthanasia referred to, this means that one should be very cautious as to what people mean when they think they are discussing ‘euthanasia’. Because newspapers are generally considered to be an important source of health information , this kind of definitional variability is likely to feed misunderstanding and confusion in public debates. Moreover, for effective public health policy and compliance with Dutch legal regulations, a shared understanding of key concepts and terminology is essential. In 2010, of all deaths in the Netherlands, 2.8% were the result of euthanasia . Physician-assisted suicide was practiced less often, in 0.1% of all deaths. The large majority of euthanasia patients were diagnosed with cancer, were younger than 80 years of age, had a very short life expectancy and all were considered to be mentally competent when they made their request . Euthanasia for persons who are old but not terminally ill, or who have (partly) lost mental capacity (e.g. due to a psychiatric disease, a coma or dementia) is practiced rarely. Yet euthanasia for these patients groups is quite commonly discussed in Dutch newspaper articles. Rather than reflecting practice, this reflects current medical and political debates about euthanasia which predominantly focus on the boundaries of current legislation. Examples of such boundary debates include the legitimacy of accepting “unbearable suffering” as a reason for euthanasia in patients with no serious medical condition [10, 11], and the degree to which advance directives might substitute for a verbal request when the patient has become mentally incapacitated [12–14]. Media coverage of the practice of euthanasia, therefore, reflects a focus on more controversial cases rather than reporting on the majority of situations in which euthanasia is actually performed. While the media as such fulfils an important task of contributing to a societal debate and highlighting controversy, such coverage may lead to an inaccurate perception of the practice of euthanasia by the public . Until recently, the Netherlands was known for tolerant policies on controversial issues such as abortion, drug abuse and euthanasia . Factors often mentioned as contributing to these policies are the openness of the Dutch in discussing difficult issues, their tendency to prefer consensus and a strong trust in health-care providers [8, 17]. This is also reflected in the fact that the Euthanasia Law receives ample support among the general public and health care professionals . However, our study shows that Dutch public debate about euthanasia, especially its boundaries, does not necessarily involve an easy consensus. The opinions of both advocates and opponents allowing euthanasia for controversial groups are clearly visible, with a wide array of arguments for and against euthanasia being presented. The most commonly used arguments for euthanasia were that self-determination is a right and that the practice alleviates severe or unbearable suffering. The responsibility of society to regulate the response to the wish for assistance in dying of patients experiencing unbearable suffering was emphasised in these arguments, which are all central in current medical, ethical and political debates about euthanasia. A few newspaper articles argued that euthanasia might be a solution for the aging of the population or be a way of conserving scarce resources, which is obviously a morally more problematic argument, though perhaps attractive to journalists wanting to focus on more extreme positions. Arguments against the use of euthanasia refuted the right to self-determination and presented a different perspective on the core responsibilities of society, by focussing on the need to protect the vulnerable. There were also claims that suffering can be meaningful. Our study also sheds light on a less debated aspect of the practice of euthanasia, that is, whether euthanasia contributes to a good death. This argument divides opponents and advocates of euthanasia. On the one hand, it is argued that euthanasia might contribute to a good, dignified, “civilized” death, for example by preventing distressing forms of suicide. On the other hand, euthanasia is described by some as too abrupt and unnatural for both patients and relatives and as a disturbing experience for physicians. This illustrates how perceptions about this practice and the dying phase in general may vary, and it underlines the need for medical practitioners to both counsel patients and their families about the course of their illness and dying phase, and to consider their own responses to such momentous end-of-life decisions as euthanasia. Nearly a quarter of the newspaper articles use the term euthanasia for practices that are outside the scope of Dutch euthanasia law, and newspapers typically discuss the more unusual cases such as euthanasia for patients with dementia or a psychiatric disorder. This has the potential to confuse the public debate about euthanasia, and means that physicians should be aware that their patients may have mistaken views about what euthanasia is, who it is for, and what circumstances lead to a decision to carry out euthanasia. Despite the legalisation of euthanasia in the Netherlands, the debate about its acceptability and boundaries is ongoing and both sides of the debate are clearly represented. JACR and NJHR were responsible for the analysis of the data. All authors made substantial contributions to conception and design of the work, acquisition of data, or analysis and interpretation of data; drafting the article or revising it critically for important intellectual content; and final approval of the version to be published.